Once a calf is born we vaccinate them for several things as soon as possible, dip the naval in an iodine solution, and give them colostrum. Colostrum is the first couple milking after a cow calves. The milk is much thicker and contains a lot of antibodies to give the calf’s immune system a nice jump start, plus extra energy. 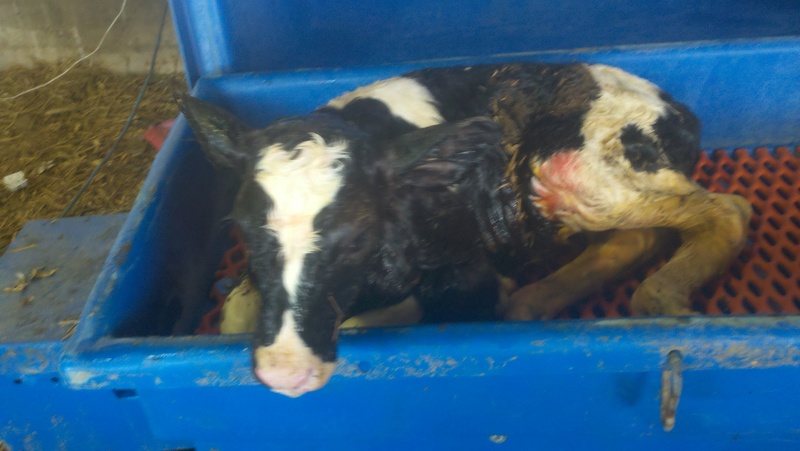 We try to get colostrum into the calf within 3 hours of birth. There is a limited window after the calf is born that they can absorb the antibodies in the colostrum directly into their bloodstream. Basically immediately after birth the calf starts to lose that ability, and by 12 hours the calf has completely lost that ability, and colostrum will do the calf no good. Research has shown that getting the calf the colostrum with in the 3 hour window is best. A calf that doesn’t get enough quality colostrum soon enough faces a steep uphill battle. Often times those calves just won’t make it. So we take getting colostrum into the calf very very seriously. As I mentioned we also vaccinate to keep the calves healthy. We are very diligent and aggressive vaccinating calves and cows, we would rather vaccinate and avoid having to treat the animals with medicine. Average of 1 calf a day! The daily activities on the farm must make life interesting. Newborn care is vital. You guys do a great job! The calf warmers were new for me. Happy Calves!